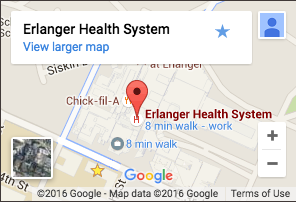 Why Choose The Erlanger Sports and Health Institute? The Erlanger Sports and Health Institute is a collaboration of leading sports-medicine specialists in primary care, orthopaedics, neurology, cardiology, and more. We serve the region’s top teams and teach the latest sports medicine techniques to tomorrow’s doctors. And we offer the most comprehensive care available for athletes and active sports-loving families. Watch our Medical Director, Dr. Bill Moore-Smith, talk about why patients should consider Erlanger. Leading specialists in family medicine, orthopaedics, neurology, cardiology, and rehabilitation collaborate to help you get back in action. Convenient locations include Erlanger North and our Main office downtown which also offers a sports injury walk-in clinic during the fall season. Read the latest articles and watch videos by our experts on the diagnosis and treatment of injuries in competitive and recreational sports.